Experts from across the UK’s £12m drought and water scarcity research programme – About Drought – will be sharing insights at EGU2019, including Dr Katie Smith who has been invited to present a keynote talk. Droughts and water scarcity jointly pose a substantial threat to the environment, agriculture, infrastructure, society and culture in the UK, yet our ability to characterise and predict their occurrence, duration and intensity, as well as minimise their impacts, has often been inadequate. From the new ‘Shiny’ app to share and visualise data to a searchable archive of past drought impact information from diverse documentary sources going back 160 years, as well as podcasts and drought myth-busting videos, About Drought has brought together science and social sciences in a successful interdisciplinary approach that addresses current and future water scarcity challenges. Four projects have been funded as part of this major programme with an additional final project – ENDOWS (known as About Drought) – focusing on engaging with stakeholders, practitioners and the public to involve them in the programme and to disseminate information about the findings, outputs and datasets that everyone can use. ENDOWS is also enhancing operational drought management through improved monitoring and early warning of drought which is being co-developed with stakeholders during the ongoing dry weather. Research also covers the impact of climate change and weather it is increasing the chance of events like the 1976 North West European drought occurring. The programme is funded by NERC, ESRC, EPSRC, BBRC and AHRC. Although the programme does not wrap up until later this year, last year’s drought across Europe called elements of its outputs into operational use ahead of schedule, by water suppliers, regulators and policy-makers. You can hear about this and other aspects of the programme during EGU2019 in Vienna, April 7-12. Historic Droughts – understanding past drought episodes to develop improved tools for the future. IMPETUS – improving predictions of drought to inform user decisions. MaRIUS – managing the risks, impacts and uncertainties of drought and water scarcity. DRY – Drought Risk & You – bringing together stories and science to support better decision-making for drought risk management. Keynote talk for session “Hydrological extremes: from droughts to floods” – What’s past is prologue: Reconstructing historic flow data to inform management of future hydrological extremes. Session “Hydrological extremes: from droughts to floods” – UK Hydrological Droughts: how severe were historic events? 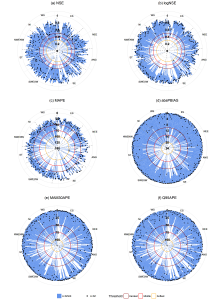 Insights from a systematic event characterisation and ranking over the last 125 years. Read the abstract. Session “Using R in Hydrology”. 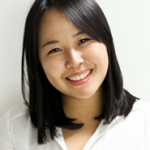 Lucy is a co-convenor and will be presenting her Shiny app, developed within the Historic Droughts project, as a demo of how you can use Shiny to share and visualise data. Read the abstract. Follow Lucy on Twitter @lucybarkerjane. The work Mike will be presenting is not directly funded through About Drought but the understanding of the causes / triggers of algal blooms in the River Thames will be used within ENDOWS this year to predict how the size and magnitude of algal and cyanobacterial blooms may change under future climate scenarios / future droughts. Session “Advancing understanding of hydrochemical and ecological processes controlling fate of natural organic matter, nutrients and pollutants in freshwater and engineered systems using state-of-the-art methods” – Utilizing high-frequency, automated monitoring to determine nutrient sources, fates and impacts on microbiology in the River Thames catchment, UK. Read the abstract. 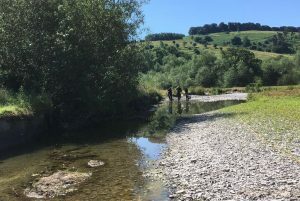 Nikos is contributing to development of stakeholder bespoke visualisation schemes for sub-seasonal/seasonal forecasting of river flows and in the development of nationally consistent datasets, aiming to enhance resilience in the UK public water sector. 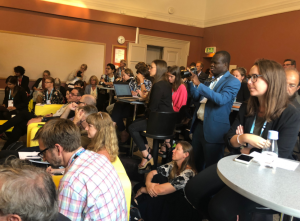 Session “Extreme meteorological and hydrological events induced by severe weather and climate change” –Drought Libraries: a nationally consistent toolkit for improved resilience in the UK public water supply sector – poster presentation. Read the abstract. You can follow Nikos on Twitter @NikMastrantonas. 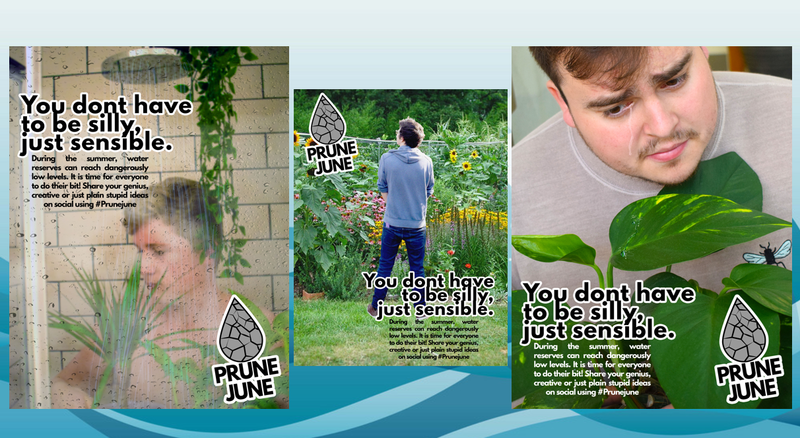 Listen to our podcasts featuring audio anecdotes with people recalling the 1976 drought, gardening, wildfire, media coverage of drought and water saving campaigns. 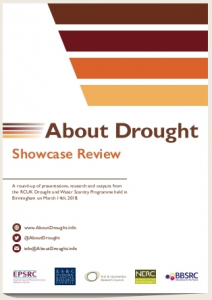 Browse this About Drought website to discover more about our research, latest events and sign up to the About Drought newsletter. From hydrological modelling to drought communications strategies, from Italy to Birmingham, an impressive line-up of speakers has been released for the Drought & Water Scarcity Conference in Oxford – a must for anyone in research and policy aspects of water supply, quality, data, modelling, environment, agriculture, risk, policy, regulation and more. 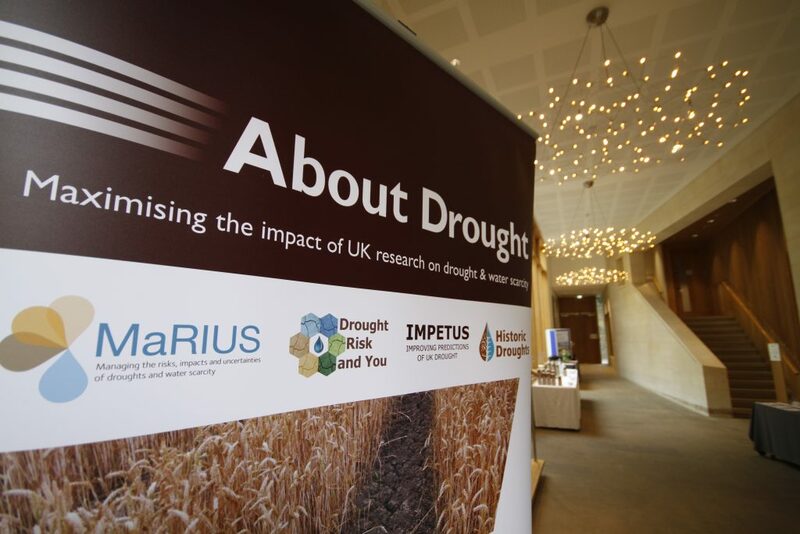 The 2-day conference – March 20-21 – is organised by the UK Drought & Water Scarcity Research Programme (About Drought) and hosted by the University of Oxford. It will take an international perspective on droughts affecting our world, covering themes of climatology, hydrology, risks and impacts of drought, planning and impacts on communities and businesses. Dr Helen Gavin, of the Environmental Change Institute at the University of Oxford, is manager of About Drought’s MaRIUS project. She says: “The World Economic Forum has ranked water crises as among the top five global risks in 2019 – for eight years running. Not only is it a major risk, but water crises are linked to many other social and environmental significant risks that confront our society. In our globally connected world, droughts and water scarcity affect everyone, and the unprecedented events experienced in recent years highlight a real long-term risk of severe drought. “In response to this risk, our conference, “Drought and Water Scarcity: addressing current and future challenges”, focuses on the science, impacts and management of droughts, featuring case studies from around the world from highly regarded speakers. The full programme can be viewed on our conference webpage, or downloaded as a PDF. Tickets cost £90 (2 days) or £50 (1 day). Booking is open via the Oxford University booking system. Booking closes on March 13th. If you are going to IRRIGEX on February 27-28, you can talk to our experts from the About Drought programme on Stand 10. With many farmers unable to fill their reservoirs and time running out for winter fills, our leading researchers will be available at the two-day exhibition, in Peterborough, for informal conversations about the wealth of decision-supporting data About Drought has already made available. 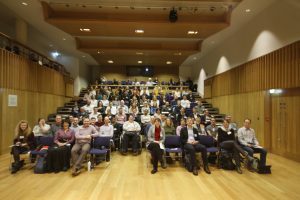 Two of our team – Professors Ian Holman and Jerry Knox of Cranfield University also feature in the impressive programme of speakers and seminars. In last summer’s drought some tools produced by About Drought – the £12m UK Drought & Water Scarcity Research Programme – were fast-tracked into real-time use in some sectors. Forecasts are currently indicating below average rainfall for this month and March so IRRIGEX is a timely opportunity to find out more about the tools available and how they can support your decision-making. 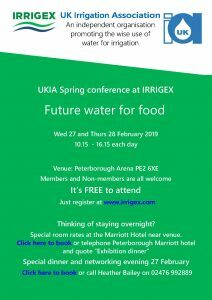 The theme for IRRIGEX this year is ‘Future water for food’ and it is free to attend. For full details visit www.irrigex.com. We look forward to meeting you on Stand 10. 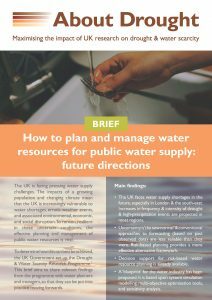 This About Drought brief, How to plan and manage water resources for public water supply: future directions, looks at some risks, challenges and opportunities for supplies of safe and wholesome water to the UK population. It aims to help water planners and managers by presenting some of the most up-to-date approaches for dealing with uncertainty, including simulation and risk-based approaches, offering guidance on decision support tools and indicating future directions for planning and managing water resources. This is the second of a series of briefs to support improved decision making in relation to droughts and water scarcity. 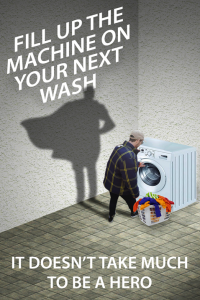 The UK faces water supply shortages in the future, especially in London & the south-east. Increases in frequency & intensity of drought & high-precipitation events are projected in most regions. Uncertainty is ‘the new normal’ & conventional approaches to forecasting (based on past observed data) are less reliable than they were. To remain resilient in these uncertain conditions, the effective planning and management of public water resources is vital. Decision support for risk-based water resource planning is already available, and this brief aims to share some relevant findings from the DWS programme with water planners and managers, so that they can be put into practice moving forwards. 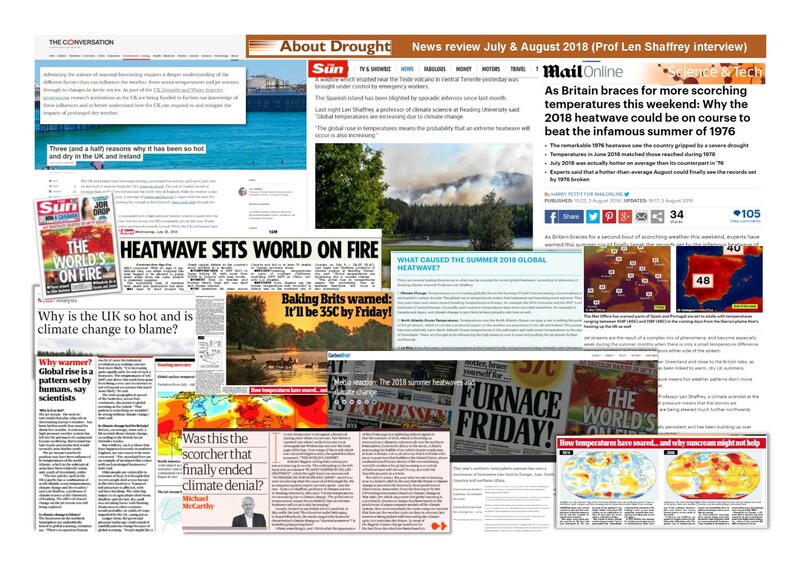 About Drought’s Len Shaffrey wrote an article in Conversation UK in July which triggered heatwave and drought articles across the UK media spectrum. Len, who leads the About Drought IMPETUS project, improving predictions of drought to support decision-making, is particularly pleased to see climate change make The Sun front page. Read his original article in Conversation UK. If you want to promote your About Drought research, contact the project office on info@aboutdrought.info.